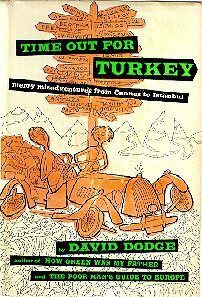 David Dodge returns to his travel-adventure style with Time Out for Turkey. 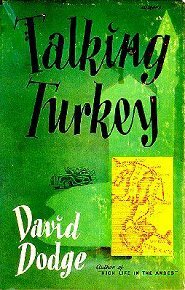 In this book, David and Elva depart from the south of France on a round-trip honeymoon to Istanbul with strict instructions from 11-year old Kendal, who has been left behind in a boarding school in Cannes, to be home in time to see her make a star turn on the stage in her schools Christmas play. Their mode of transport for this journey is Invictus, a small, low-powered European [car] intended for good highways and loving kindness. The car doesnt receive much of either in this tale, but, true to its moniker, does get them as far as Athens. Along the way they experience Trieste, Sezana, Ljubljana, Zagreb, Belgrade, Sarajevo, Dubrovnik, Titograd, Andrijevica, Pec, Skopje, and Saloniki—hunting down mechanics at nearly every stop—before making the jump from Athens to Istanbul by plane. On the way back, they take time out in Venice, Florence, Pisa, and Genoa before Invictus finally gives up the ghost outside of Nice and they have to do the final leg back to Cannes by public bus, with only a few hours to spare before curtain-time.